OHEL Children’s Home and Family Services and The Americare Companies Proudly Present: OHEL 5770: Musical Aspirations – Let the journey begin. 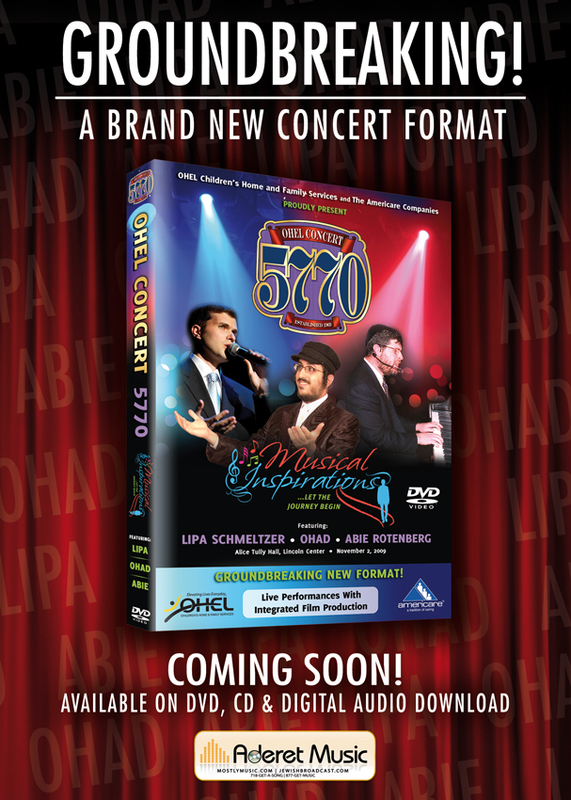 Featuring Lipa Schmeltzer, Ohad and Abie Rotenberg Live Performances With Integrated Film Production Experience the sold out concert that dazzled the viewers at Lincoln Center with its ground breaking format. We invite you to take part in a genuinely original experience that will combine the outstanding concert you have come to expect every year from OHEL, with an original film and live performance. This event is an entity so fresh and unique that its format has no name – it defies a standard label. As the evening builds, each segment of the story is represented both on stage and screen, with each song performed by the singers carefully selected to mirror each film segment’s specific theme. The OHEL Benefit Concert is about music, inspiration, and the life lessons we can all learn. It’s about one man’s journey toward his better self and the difficult choices he must make along the way. It’s about OHEL and how its myriad services provide a unique brand of caring and support that elevate the lives of everyone involved – whether on the giving or the receiving end. AN ADDITIONAL HOUR OF ENTERTAINMENT! Bonus Features: Behind-the-scenes, Outtakes AND MORE! COMING FOR CHANUKAH!! Video extras to follow shortly!